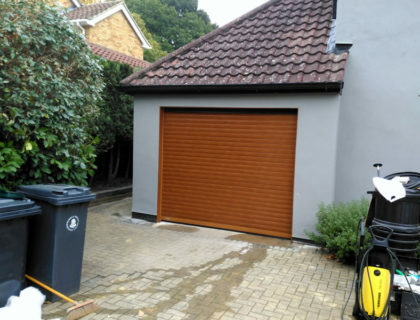 The SeceuroGlide Compact is a versatile roller garage door that can be fitted in-front of or behind the garage opening. The compact roller curtain has been developed especially for garages with severely limited space above the opening. Compact roller garage doors are available in four paint and two woodgrain finishes that combine low maintenance with durability. Each one comes supplied complete with a single channel SeceuroSmart receiver with built-in courtesy light, two key fob transmitters, a bottom slat safety sensor and an internal manual override. 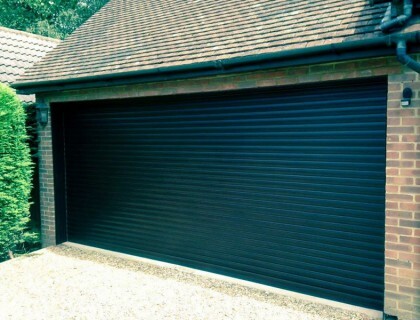 All roller garage doors are available with an optional alarm, please ask for details. Insulated aluminium slats – The Compact utilises an insulated aluminium slat that is significantly narrower than those featured on the SeceuroGlide. Refined Engineering – The 75mm fluted axle provides an ultra strong core, while the helical collars enable tighter space-saving coiling and significantly reduce curtain marking. Control Unit – All our roller garage doors utilise the tried and tested control unit, which combines a courtesy light with both remote and push button control functions. The unit is also available with an optional 90db alarm system. Manual Override – All roller garage door are supplied with a simple manual override crank, ensuring you will never be accidentally locked in your garage – even in a power-cut. Also available are external low-level override and battery backup options.